How calm white fluffy clouds, they drift and float through. Like passing thoughts. A cloud passes by freely through the sky. I see the baby elephant in the last one. 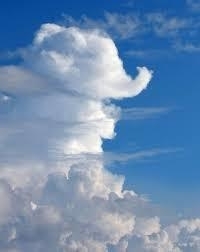 that photo of cloud percieve to be a baby elephant.im somewhat artistic eye.aye. I see an intercontinental European speed-train with a driver and conductor. Don't be fooled, @silver. That's a sky snail mimicking an elephant head. I've seen them do it before. Don't fall for it. More than 2,500 years ago, there was a king called Suddhodana. He married a beautiful Koliyan princess named Maha Maya. The couple ruled over the Sakyas, a warrior tribe living next to the Koliya tribe, in the north of India, in what is now known as Nepal. The capital of the Sakya country was laid out across the foothills of the Himalayas and called Kapilavatthu. Queen Maha Maya was the daughter of King Anjana of the Koliyas. Such was her beauty that the name Maya, meaning "vision" was given to her. But it was Maya's virtues and talents that were her most wonderful qualities, for she was endowed with the highest gifts of intelligence and piety. King Suddhodana was indeed worthy of his lovely wife. He himself was called "King of the Law" because he ruled according to the law. There was no other man among the Sakyas more honored and respected. The king was admired by his nobles and courtiers, as well as by the householders and merchants. Such was the noble family from which the Buddha was to arise. One full moon night, sleeping in the palace, the queen had a vivid dream. She felt herself being carried away by four devas (spirits) to Lake Anotatta in the Himalayas. After bathing her in the lake, the devas clothed her in heavenly cloths, anointed her with perfumes, and bedecked her with divine flowers. Soon after a white elephant, holding a white lotus flower in its trunk, appeared and went round her three times, entering her womb through her right side. Finally the elephant disappeared and the queen awoke, knowing she had been delivered an important message, as the elephant is a symbol of greatness in Nepal. The next day, early in the morning, the queen told the king about the dream. The king was puzzled and sent for some wise men to discover the meaning of the dream. The wise men said, "Your Majesty, you are very lucky. The devas have chosen our queen as the mother of the Purest-One and the child will become a very great being." The king and queen were very happy when they heard this. They were so pleased that they invited many of the noblemen in the country to the palace to a feast to tell them the good news. Even the needy were not forgotten. Food and clothes were given to the poor people in celebration. The whole kingdom waited eagerly for the birth of the new prince, and Queen Maya enjoyed a happy and healthy pregnancy, living a pure life for herself and her unborn child. Your awareness becomes clear and open too like the sky and this becomes an access point for the clear and lucid spontaneous awareness of the natural state itself. That's when you realise that the Thai masters who talk about Buddho, poo roo or "the one who knows" are referring to the same thing. ‘About this mind ... in truth there is nothing really wrong with it. It is intrinsically pure. Within itself it’s already peaceful. That the mind is not peaceful these days is because it follows moods. The real mind doesn’t have anything to it, it is simply (an aspect of) Nature. It becomes peaceful or agitated because moods deceive it. The untrained mind is stupid. Sense impressions come and trick it into happiness, suffering, gladness and sorrow, but the mind’s true nature is none of those things. That gladness or sadness is not the mind, but only a mood coming to deceive us. The untrained mind gets lost and follows these things, it forgets itself. Then we think that it is we who are upset or at ease or whatever. ‘But really this mind of ours is already unmoving and peaceful... really peaceful! Just like a leaf which is still as long as no wind blows. If a wind comes up the leaf flutters. The fluttering is due to the wind – the ‘fluttering’ is due to those sense impressions; the mind follows them. If it doesn’t follow them, it doesn’t ‘flutter.’ If we know fully the true nature of sense impressions we will be unmoved. 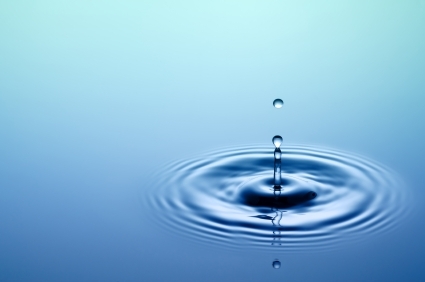 Or you can use the simile of still water for pure awareness and the ripples like clouds are the merely transient appearance that arise and pass away. When we get distracted by them, the calm is lost. I love clouds, but I reckon thoughts are more like birds flying in the sky. 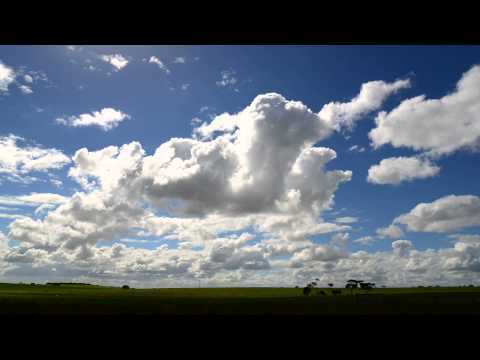 Clouds move more slowly, maybe like moods? I live near the sea and there are lots of noisy seagulls, they are rather like random thoughts flying around. Sometimes I feed them bread ( wholemeal, obviously ), and they all gather to fight over it, thereby creating a "brain-storming" session. ...Isn't that known as 'food for thought'...? I iz the sky? I knew it! We have thoughts and emotions in our sky. Where then the body? The Ground of Being? Or being ground?